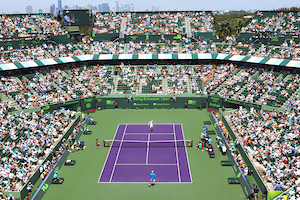 Tag Archive | "Masters 1000"
The 30th edition of the men’s final at the Miami Open was contested between Novak Djokovic and Andy Murray. 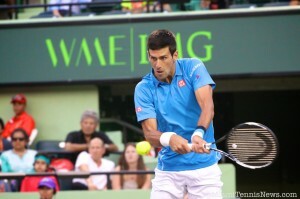 Yet again, Djokovic outlasted Murray 7-6, 4-6, 6-0 to bank his fifth title in South Florida. In January at the Australian Open final, Djokovic manhandled his counterpart 6-0 in the fourth set to claim the trophy. The second Masters 1000 of the year was a chance for Murray to apply the brakes on a seven match skid against Djokovic against, he had an 8-17 record. Moreover, since his triumph in the 2013 Wimbledon final, Murray is 0-11 versus the combination of Djokovic, Rafael Nadal and Roger Federer. With a forehand crosscourt winner, Murray manufactured a break point in the opening game. Although Djokovic held, for the Brit, this was a positive development. The next time Murray had break point, he struck an overhead winner for a 2-1 lead. But, Murray’s advantage was short-lived. The Brit failed to consolidate ahead 40-30. As Djokovic misfired on three backhands in the seventh game, Murray broke at love for 4-3. Swiftly, it was Djokovic’s turn at triple break point and he leveled the set. With no further break points on offer, the opening set was decided by a tiebreaker. Murray‘s caution at this juncture resulted in miscues. Courtesy of that generosity, Djokovic stormed to a 4-0 edge and ultimately with ease secured the first set. In the third game of the second set, Djokovic had opportunities to tighten the rope around Murray’s neck with four break points. However, by serving well, the Brit recovered and kept the score in his favor for 2-1. With the score 4 all and 40-30, Murray was given a time violation warning. This could have derailed him. Yet, the two time Miami Open champion overcame that distraction to hold for 5-4. Soon, Murray blazed a forehand crosscourt winner off an overhead from Djokovic for 0-40. Then, with the Brit crushing a second serve backhand return crosscourt for a winner, a decisive set was needed to determine the victor. The bipartisan crowd could hardly contain its glee as cries of “come on Nole or come on Murray” reverberated throughout the stadium. The public was salivating at the prospect of these two warriors dueling to the death. The last couple of years, Djokovic has mastered the art of wrestling momentum away from his rivals. Once again, Murray learned there was no mercy for miscues. In an opening game where Murray had game point, Djokovic capitalized on his opponent‘s sleuth of errors to come away with the break. After the Serb consolidated for 2-0, Murray double faulted to stare at 0-40. Despite getting to deuce, Murray could not overcome three more break points. Hard to phantom, but in a 48 minute set, Murray failed to post a single game. Although the forecast was 75 and partly cloudy, it felt closer to 90 on the court. According to Murray, “I struggled physically, I played well for a couple of sets. I wasn’t getting in the right positions to hit the ball in the last set”. At 27, both players have had triumphant careers. But, with his win at the Australian Open, Djokovic became the first player since 1968 to collect five prizes Down Under. Today, with his 22nd masters shield, he accomplished for a third time the Indian Wells-Miami Open double, something that had never been done. Moreover, Djokovic is one Masters 1000 title away from tying Federer in the number two spot. On the historical perspective, Djokovic commented “it’s nice and flattering to hear that I have achieved another record. Any achievement that goes into the history books I’m hugely proud of and appreciate because I work hard for it and I do cherish it. It allows me to motivate myself even more.” Next year, at the Miami Open, the bar for Djokovic will be equalizing Andre Agassi’s record with a sixth title.